I see the pain of love everyday. Love hurts. I’m experiencing it right now as the failing health of my mom is a stark reminder that I will not have her with me forever. How can something that feels so powerfully good, feel so awful at times? In Abraham Maslow’s hierarchy of needs, he lists “love and belonging” as a fundamental human need for survival. Loving and being loved is a basic human longing. Relationships have a beginning and an end. Holding on feels so good. Letting go hurts so bad. The first jolt of pain hits most of us in our teenage years when we experience our first love. The inevitable reak-up really hurts. Disappointment – a pattern of negative behavior from someone you love hurts. Repeated broken promises is another disappointment that hurts. Faded love – falling in then falling out of love. While one feels love, the other finds it has faded away. Betrayal – from someone you love feels like a dagger in your heart. Natural Endings – the natural course of ending after a life well lived. The movie, Shadowlands portrays the story of author/professor, C.S. Lewis’ marriage to the American poet, Joy Gresham. Originally, the marriage was a transactional agreement to provide a pathway for Joy to secure citizenship in England. The couple eventually fell in love. Shortly thereafter Joy was diagnosed with a terminal illness that took her life. Lewis, struggled with the concept of love because of the pain involved. Here is an excerpt from the movie. Jack (C.S. Lewis): Why love, if losing hurts so much? I have no answers anymore: only the life I have lived. Twice in that life I’ve been given the choice: as a boy and as a man. The boy chose safety, the man chooses suffering. The pain now is part of the happiness then. That’s the deal. Joy Gresham: We can’t have the happiness of yesterday without the pain of today. That’s the deal. The pain of love is inevitable. We cannot have the happiness of love without at some point, experiencing the pain. When the behavior of someone you love wounds your heart it hurts. One may wonder, “Can I survive this?” “How do I cope?” Knowing that some pain is inevitable, how does one heal? And–is it worth it to love again? Tough questions. 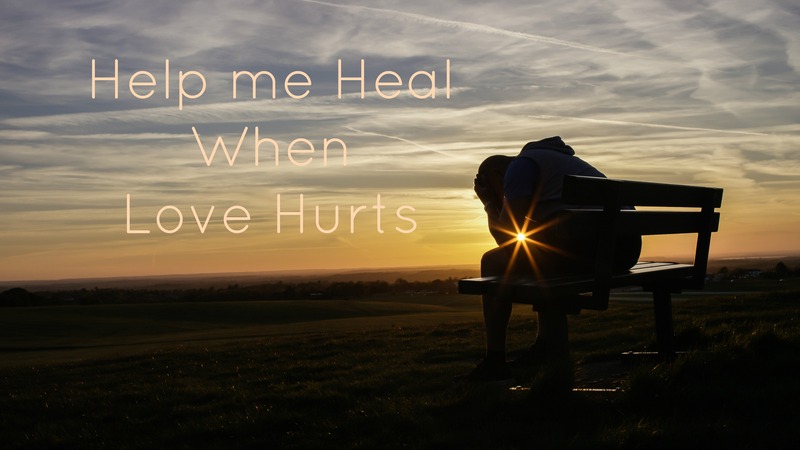 Here are 5 ways to heal when love hurts. Don’t try to suppress or avoid the emotional pain. You have to muster the courage to be present with your feelings. Release the hurt. Express the emotion. Let the tears flow. Sometimes you will be all alone when the hurt surfaces. Remember #1. You will also need a trusted person nearby to express your feelings when love hurts. A supportive person can offer you comfort, a shoulder to cry on. You will not feel completely alone. You cannot fast track your feelings. Avoiding, suppressing, moving on, not thinking about it, is not a healthy approach. Your pain will leak out in ways that do not serve you well. Take the pressure off yourself to get over it quickly. Nor should you go on mourning forever. If you follow steps 1 and 2, healing will likely follow a natural course. The journey of love contains memories and experiences that were deeply meaningful at the time. Or, it produced something that has lasting value. Treasure the good. Don’t discard it because of the bad. Find it in your heart to forgive the bad that occurred when love hurt. Because the pain of love hurts so deeply, some fear loving again. It’s akin to touching a hot stove. It hurts and you don’t want to experience that anymore. You can choose safety and be lonely. Or, you can take a risk to love again and experience the deep meaning that comes from love and belonging, understanding that ending is a natural part of the journey. Are you feeling hurt by love? What can you do today to heal? Review the 5 areas and choose one thing you can do to address your pain.